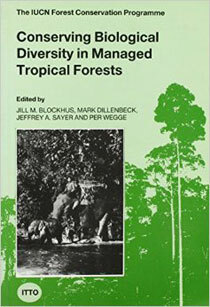 At the meeting of the International Tropical Timber Organization held in Bali in 1990, ITTO adopted the target of ensuring that all tropical timber marketed internationally should, by the year 2000, come from forests that are managed sustainably. This study is an attempt to determine whether the member countries of the ITTO have a legal and administrative basis for managing their production forests in ways which will allow these forests to contribute to biological diversity conservation. It also attempts to assess the extent to which such management is already applied on the ground through member country studies. A set of guidelines on ways in which management of production forests could be improved is included.